Pittsworth, a rural town, is 135 km south-west of central Brisbane and 35 km south-west of Toowoomba. It is situated on a basaltic upland overlooking alluvium floodplains of the Darling Downs to the west. When the area was first settled most of the land was taken for the Beauaraba pastoral station. Pittsworth began as a wayside hotel and was known as Beauaraba. 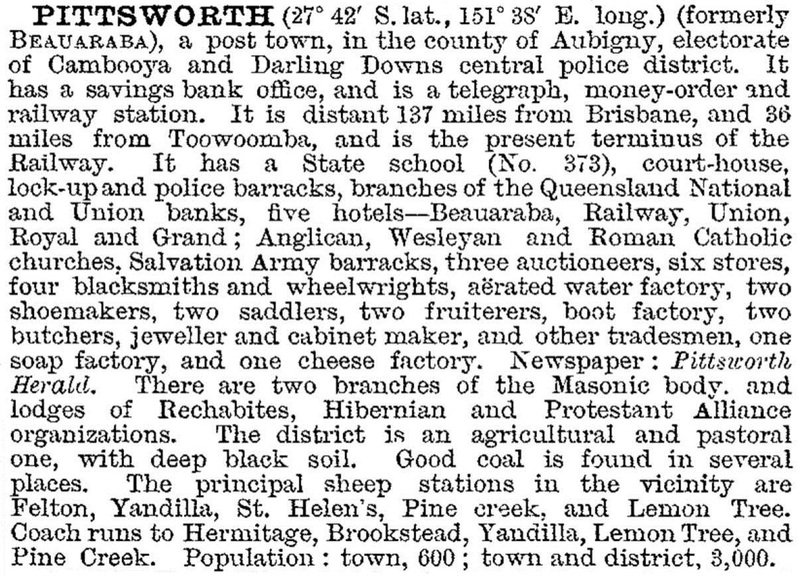 The name was changed formally to Pittsworth in 1915, although contemporary gazettes record 'Pittsworth, formerly Beauarba' as early as 1903. The Pitt family had large landholdings, dating from 1854 when it had the Goombungee pastoral station. By the 1880s farm selections had been taken up around Beauaraba and a branch railway line from Toowoomba was opened in 1887. Pittsworth was the railway terminus until 1911, when the line was extended to Millmerran. The first school opened in 1882. The Catholic church, St Stephens, was rebuilt in 1908-10 as a grand Gothic edifice, and a convent school was opened in 1916. After the war a soldiers memorial school of arts was opened. Pittsworth also became the administrative centre of its own shire when a new local government area was excised from Jondaryan Shire in 1913. The town continued to steadily grow, adding a hospital and a bowling club, but losing a couple of its hotels to fire. Today the last remaining grand timber hotel is the Tattersalls. The former shire hall and council chambers (1914) in Short Street are listed on the Queensland heritage register. The shire hall and offices (1914) are listed on the Queensland heritage register. Yandilla Street is the main commercial thoroughfare, and several of the streets are planted with Silky Oaks and Jacarandas. A high school was opened in 1967 out of town near the showground. At other points of the compass, away from the town centre, there are a golf course, a bowling club and a historical museum. Pittsworth's outstanding historic personality was Arthur Postle (1881-1965), a world champion sprinter known as the Crimson Flash. A notable historic building is the ANZ bank (1905) in Yandilla Street. The notable churches are St Stephen's Catholic (1910), St Andrew's Church of England (1913) and the modern St Peter's Lutheran (1968). In the town there are also the Uniting church, a Catholic primary school (1916), a swimming pool, two hotels, two motels and a caravan park. There are an annual show in March and an annual Spring garden competition: Pittsworth's gardens are a notable accompaniment to the flowering street trees. The Pittsworth abattoir was closed in February 2010 when the Leitch Pastoral Group ceased operations, resulting in the loss of more than 100 jobs.